The abs and waist are a trouble spot for many people, and women in particular may feel pressure to maintain a trim waist. You may worry that exercising the abs -- particularly the obliques -- will make your waist bigger, and this can indeed happen, depending upon your overall fitness routine and physical condition when you begin working out. However, there are several things you can do to reduce the likelihood of your waist growing larger, and, with the right workout, you can end up watching the pounds melt off your waist. Abdominal exercises such as crunches and planks burn a few calories, but their primary purpose is to build muscle. If you have a lot of fat on your waist when you begin working out, building up a layer of muscle underneath the fat can make your waist look larger. For this reason, it's important to work on both strength-building and calorie-burning. The most effective way to burn fat throughout your body is cardiovascular exercise. 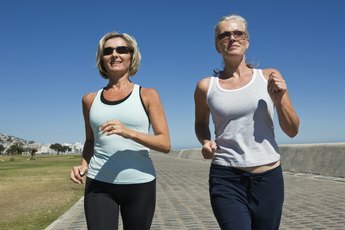 Cardio includes any exercise that works large groups of muscles and increases your heart rate. Cycling, running and jumping on a trampoline are all good choices. For even more calorie-burning power, try adding interval training to your cardio routine. Simply alternate between intervals of high activity and moderate activity. For example, if you're running, sprint at a rapid pace for one minute, then slow to a brisk walk for a minute, alternating between the two paces throughout your run. No matter how much exercising you do, you're unlikely to lose much weight if your diet is high in calories. In conjunction with a poor diet, ab exercises can make your waist look larger because you'll be building both muscle and fat. Muscle weighs more than fat, so you might also end up gaining weight. Focus on a reduced calorie diet. According to the Mayo Clinic, you'll need to eliminate 3,500 calories through a combination of diet and exercise for every pound you want to lose. Targeted waist training in conjunction with fat-burning exercise can help you achieve your fitness goals. Try a bicycle crunch to tone your obliques. While lying on your back with your knees bent and feet flat on the ground, elevate your upper torso while keeping your lower back on the ground, twisting to your right side and moving your right knee toward your left elbow. Then repeat on the other side, for at least 10 reps on each side. Your abdominal muscles should be engaged by pushing the small of your back into the ground during this exercise. A side plank can also help you tone your waist and strengthen your core. Lie on your right side with your legs straight. Then, using your right arm, slowly push up off the ground while tensing your abs. Hold for 30 seconds, then repeat on the left side. Do Abdominal Exercises Make the Stomach Stick Out More at First? Does Working Out Give You a Belly Bulge?